Appearance day of Lord Narasimha : 14th Lunar day of the waxing phase of Vaisakha lunar month is celebrated as the appearance day of Lord Narasimha. SIGNIFICANCE: Lord Vishnu’s 4th incarnation was in the form of half-lion/half-man, known as Narasimha (Nara means man and Simha means lion). In this particular incarnation, he saved the life of his devotee Prahalād from his father who was a demon king Hiranyakashipu. Hiranyakashipu was dead against his son’s devotion to lord Vishnu. 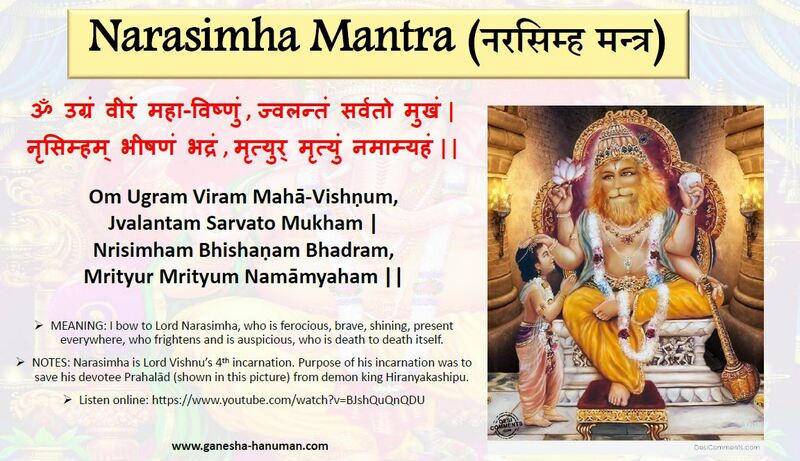 He challenged his son that if his Vishnu is real, he should appear in front of him and save him. Lord Vishnu did. Hiranyakashipu had received a boon that he cannot be killed by a man or an animal, he cannot be killed during day or night time, he cannot be killed inside or outside, he cannot be killed on the earth or in the sky and he cannot be killed by any weapon. So lord Narasimha (who was neither a man nor an animal) killed Hiranyakashipu at dusk (neither day nor night time) at the doorway (neither inside, nor outside), on his lap (neither on the earth nor in the skies) by piercing his chest with his nails (without any weapon). Lord Vishnu always answers the prayers of his sincere devotees. This entry was posted in Mantras on May 17, 2016 by illuminatelifetoday. For the next 7 days, Mars is the king. Mars is final dispositor (ruler) of all the planets in the skies for the next 7 days. What this means is that all the other 8 planets are in the signs which are ultimately ruled by Mars. For example: Jupiter is in Leo which is ruled by Sun — Sun is in Aries which is ruled by Mars — And Mars itself is in its own sign Scorpio. Let us take another example: Ketu is in Aquarius which is ruled by Saturn — Saturn is in Scorpio which is ruled by Mars — And Mars again is in its own sign Scorpio. Do Hatha yoga because Mars is a physical planet. Mars is in Anuradha Nakshatra right now which is connected with Radha, the consort of Krishna and embodiment of love. Bhakti and devotion as exemplified by Radha is the best remedy. This entry was posted in Uncategorized on May 8, 2016 by illuminatelifetoday.